This luxury villa is situated in an award winning luxury development set at the foot of the Basparmak mountains with beautiful sea views. The fully air-conditioned villa with private pool sleeps 6 in comfort with two bathrooms and a fully equipped modern kitchen. Outside there is a large secure terrace (in case you need to keep the little ones safe) with a large gas BBQ set in beautiful landscaped gardens. For entertainment there is an Amazon Firestick with Kodi linked to a 50" flat screen curved TV, a Sonos music system and CD and DVD player for backup with over 100 DVDs, books and games (plus plenty of pool toys). Plus of course, business-grade WiFi for that all important Internet access. There is a large fridge freezer, washing machine, dishwasher, iron and ironing board and a chilled water dispenser. The property is beautifully maintained in show room condition and have every thing you need for a comfortable, relaxing holiday. As a busy working professional with growing children, I was looking for somewhere with good weather early and late in the year that we could enjoy at any time of year. Having visited Cyprus before, it seemed like the perfect place! When on holiday, we like to relax and have everything just perfect, and don't want to feel like we are in a rental villa - consequently our villa is extremely well equipped and beautifully furnished with hand-built bespoke furniture with everything you would ever need to have a stress-free and relaxing holiday. We hope you will enjoy it as much as we do! Location, Location, Location! I bought this property because North Cyprus is simply stunning and this property is in a great location -close to great beaches, close to the Korineum Golf Club, but also on the edge of the mountains which are great for walking and exploring, yet still close to Kyrenia and within easy access of the beautiful Karpas Peninsula. There are too many to list, but personal family favourites include: scuba diving at Nature Bay (10 minutes away). Seeing the turtles at Alagadi (10 minutes away). Cycling along the old coast road (2 minutes away). Exploring the hills and mountains (10 secs away). Visiting the unspoilt beauty of the Karpas (1 hr away). Eating out at the fantastic array of local restaurants, all within 5 minutes of the villa. Ensuite bathroom to bedroom 1 upstairs with shower, wc. Downstairs bathroom with bath, shower and wc. Large open plan lounge with open fire, fully air conditioned opens out onto terrace with outside seating for six. Seating for eight. Satellite TV, DVD player, CD player books and games, free business-grade WiFi. Over 100 DVDs for all ages to choose from. Cooker, hob, American fridge freezer, washing machine, dishwasher, microwave, water dispenser, iron, ironing board. Full range of crockery and cutlery. Two Sonos One players provide fantastic sound. Simply install the Sonos app on your smartphone and link to the villa Sonos system to play any music from your phone. Plenty of pool toys plus other toys for children to play with. Large wrap around balcony that provides 360 degree views of the sea an the mountains. Large secure terrace with plenty of room for al-fresco dining using the provided tables and chairs. Great to watch the sun go down. 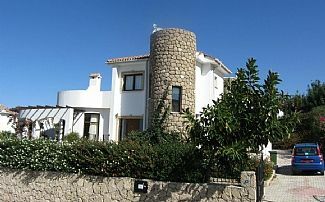 The villa is 10 minutes drive from the award winning Korineum Golf and Country Club. A private pool that is maintained twice per week in the summer season with roman steps for easy access and LED lights for evening swims. Notes on accommodation: No Smoking. Villa is fully air conditioned. Secure terracing all round the villa making it safe for small children. Outside: The villa is set in its own private, landscaped gardens, complete with a 10x5m private swimming pool and 6 sun loungers and Gas BBQ. All Terraces off the Lounge, Kitchen and Dining Room are fully enclosed by railings and can be made secure and safe for small children to keep them well away from the swimming pool. Cleaning / Towels / Linen / Maid service: Generous selection of towels and beach towels. The property is cleaned on your arrival and there is a complimentary welcome pack. Mid stay clean and change of towels and linen available for stays of 2 weeks or more. Other: Comfortable dining area for six people. Outside there are sun loungers and plenty of sun shades. Plenty of pool toys also provided for the children. Have just returned from a weeks holiday. We would highly recommend this villa. It was very clean, well maintained and had everything we needed for a relaxing holiday. Location and views stunning. Car hire needed, which was all organized for us. Lots of places to eat at but not enough days in a week to try them all. We will be back but next time for two weeks. The villa is a 5 minute walk from the sea. Two local beaches are no more than 5 minutes by car. Alagadi Turtle Beach and Nature Bay Beach are both 10 minutes by car. Tatlisu Beach is 15 minutes by car and Kaplica Beach is 20 minutes by car. The villa is 35 minutes from Ercan Airport, 1.5 hours from Larnaca Airport and 2.5 hours from Paphos. The nearest village is Esentepe which as 5 minutes drive and has supermarkets, bars, restaurants, patisserie and garage for fuel. Notes on prices: Please note that all our price are in pounds sterling (£) and are priced per week, for 4 people sharing the villa, not per person. For 5 people sharing, please add £50 to the price shown and for 6 people sharing, please add £100 to the price shown. A 5% discount will apply for rentals of 2 weeks and a 10% discount will apply for rentals of 3 weeks or more. Special rates for long winter lets - please contact us.